Stacker Bangle. Sterling Silver. Hammered Texture. Organic Texture. Bracelet. Stacking Bangle. Boho Jewelry. Silver Jewellery. Minimalist. 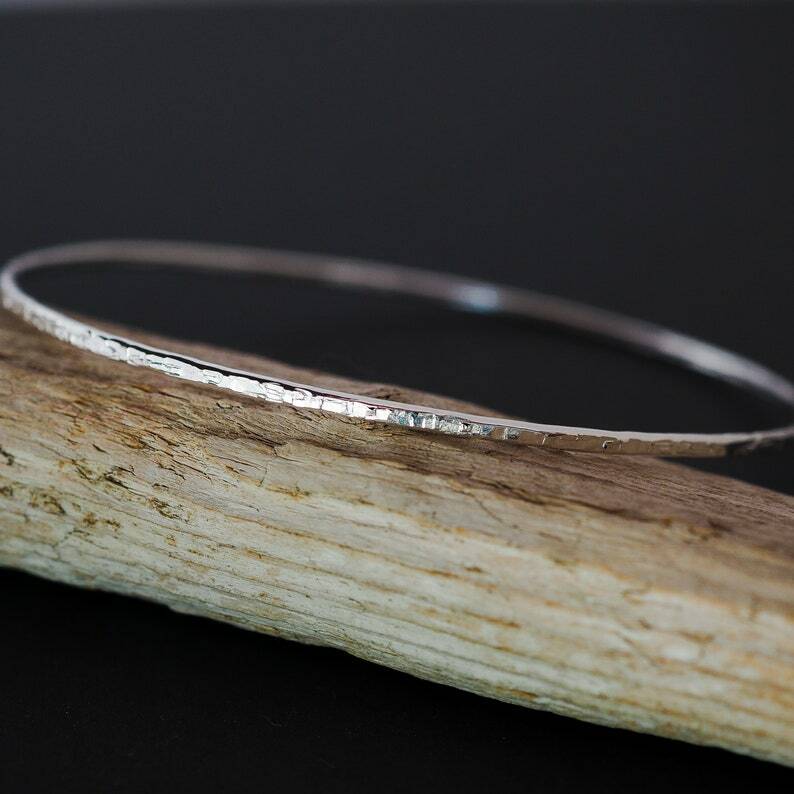 Handmade solid sterling silver stacker bangle, 2mm (5/64th inch) wide, created in my own unique organic style and texture. Wear it alone for a minimalist look or stack it with your bangle collection. Why unique? Because the texture is created using handmade custom tools. This texture is a favourite as it is made with a hammer my husband made in his forge. You wont see this design anywhere but here at Wild Forest Studio. This design I call Linen. Shown in the photo's alone and also with other textured bangles as a lovely collection. Stacker Bangle. Sterling Silver. Hammered Texture. Organic Silver. Bracelet. Stacking Bangle. Boho Jewelry. Silver Jewellery. Minimalist. Stacker Bangle. Sterling Silver. Hammered Texture. Bracelet. Stacking Bangle. Rustic Jewelry. Silver Jewellery. Minimalist. Silver Bangle. Hammered Texture. Organic Silver. Bracelet. Stacking Bangle. Sterling Silver. Boho Jewelry. Silver Jewellery. Minimalist. Silver Bangle. Bracelet. Bangle. Stacking Bangle. Sterling Silver. Boho Jewelry. Silver Jewellery. Silver Bracelet. Silver Jewelry. Sterling Silver Bangles, Hammered Bangle, Stacking Bangle, Textured Bangle, Recycled, Eco Friendly, Set of 3, Bracelet, Handmade Jewelry.